Bombskare, your friendly neighbourhood nine-skulled-skanktastrophe, are back from the dead to serve up the latest incarnation of our annual Skalloween party! Gasp in horror at Andy ‘The Hangman’* Pennycorpse! Shudder before Macabre Mikey Pepper’s furious drumming! Gaze in wonder at Hornboy’s demonic dancing! Support comes from awesome 60s style rockers Logan’s Close and local hip hop outfit The Honey Farm. Get your costumes out – every Bee or Beetle gets a free poster! 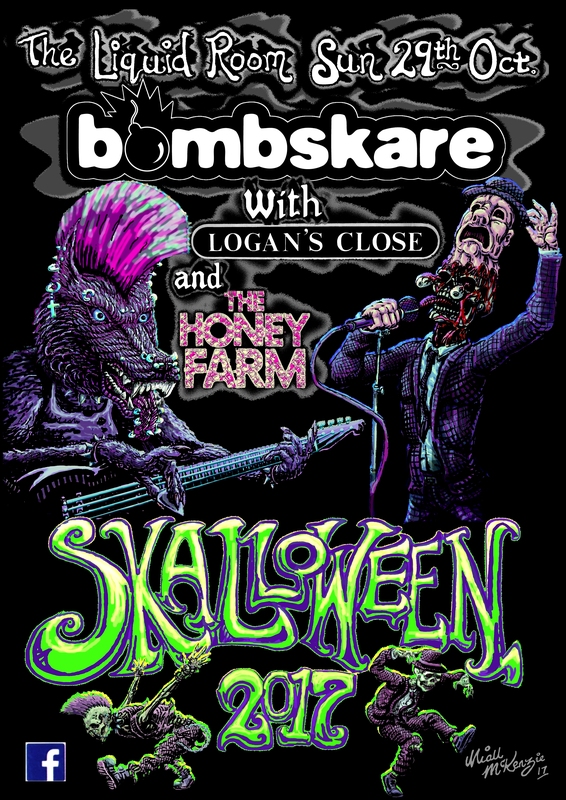 This entry was posted in News and tagged bombskare, Edinburgh, Logan's Close, ska, Skalloween, Skalloween 2017, The Honey Farm, The Liquid Rooms. Bookmark the permalink.